You will find below the horoscope of Adrianne Curry with her interactive chart, an excerpt of her astrological portrait and her planetary dominants. If you know the time of birth of Adrianne Curry, we would appreciate it if you would send us your information with your source, at stars@astrotheme.com. To thank you for contributing to the enhancement of our astrological database, we shall be glad to send you the astrological portrait (34 pages) of this celebrity. Horoscopes having the same aspect Mars conjunction Jupiter (orb 0°51'): Elizabeth II, Halle Berry, Arielle Dombasle, Jamel Debbouze, Ozzy Osbourne, Prince George of Cambridge, Joan Rivers, Richard Nixon, Michel Polnareff, Val Kilmer, Catherine Ringer, Ray Charles... Find all the celebrities having this aspect. Horoscopes having the same aspect Moon trine Jupiter (orb 1°13'): Drake (entertainer), Jared Leto, Salman Khan, Jake Gyllenhaal, Heidi Klum, Muhammad Ali, Ian Somerhalder, Evelyne Dheliat, Charles, Prince of Wales, Courteney Cox, Zendaya, Michel Sardou... Find all the celebrities having this aspect. Celebrities clicked on in real-time: 577,287,535 times. Adrianne Marie Curry (born August 6, 1982 in Joliet, Illinois) is an American fashion model and reality television star. Curry is famous for winning the first season of America's Next Top Model. She is married to Christopher Knight, who portrayed Peter Brady on The Brady Bunch. Before participating in America's Next Top Model, Curry was a waitress at Hootersand Applebee's, and Lone Star Steakhouse. She dropped out of Joliet West High School in Joliet, Illinois in 1999 when she was a junior due to having a gun pulled on her. Afterward, she earned her GED. On America's Next Top Model she mentioned having fallen for numerous modeling scams in her pursuit of becoming a model. Here are some character traits from Adrianne Curry's birth chart. This description is far from being comprehensive but it can shed light on his/her personality, which is still interesting for professional astrologers or astrology lovers. 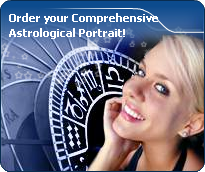 In a matter of minutes, you can get at your email address your astrological portrait (approximately 32 pages), a much more comprehensive report than this portrait of Adrianne Curry. Warning: when the birth time is unknown, which is the case for Adrianne Curry, a few paragraphs become irrelevant; distributions in hemispheres and quadrants are meaningless, so are dominant houses and houses' accentuations. Therefore, some chapters are removed from this part. The predominance of Water signs indicates high sensitivity and elevation through feelings, Adrianne Curry. Your heart and your emotions are your driving forces, and you can't do anything on Earth if you don't feel a strong affective charge (as a matter of fact, the word "feeling" is essential in your psychology). You need to love in order to understand, and to feel in order to take action, to the detriment of a certain vulnerability against which you should learn to fight. Adrianne Curry, Fire is dominant in your natal chart and endows you with intuition, energy, courage, self-confidence, and enthusiasm! You are inclined to be passionate, you assert your willpower, you move forward, and come hell or high water, you achieve your dreams and your goals. The relative weakness of this element is the difficulty to step back or a kind of boldness that may prompt you to do foolish things. After this paragraph about dominant planets, of Adrianne Curry, here are the character traits that you must read more carefully than the previous texts since they are very specific: the texts about dominant planets only give background information about the personality and remain quite general: they emphasize or, on the contrary, mitigate different particularities or facets of a personality. A human being is a complex whole and only bodies of texts can attempt to successfully figure out all the finer points. Your sensitivity is all on edge, Adrianne Curry, and your emotions so deep, your imagination, so lively, that you are often found in the sweet realm of dreams. You create your own fantastical world with entangled fragments of current reality, romantic souvenirs and hidden hopes. Your receptiveness is so intense that it may border on mediumship or, more disturbing and rare, you may have hallucinations. Your character fluctuates according to the stimulation of the moment but in general, you are a nice person, full of gentleness and romanticism, always ready to understand and to dedicate yourself. You have real healing powers, would it be only through your ability to instinctively understand other people's sufferings. Your affective structures can be likened to a roving radar. You are vulnerable, hurt by the slightest aggression and easily influenced because you are unable to step back from people and events; therefore, you may start to be doubtful and lose the self-confidence that you so badly need to progress. Your intellectual and nervous energy is considerable, Adrianne Curry, with good concentration abilities and a strong determination. You have plenty of planning and organization skills and enthusiasm. Your helpfulness is deep and you never hesitate to solve other people's problems. You are thought of as a reliable person and you enjoy it very much. You believe in your own capacities and you tend to speak with a dramatic pomposity because you want to attract attention. People who do not share your opinion are in trouble! Your determination is strongest and you may show stubbornness and inflexibility because you do not easily accept it when your ideas or your actions are criticized. Some people believe that you assert yourself in an authoritarian and condescending way, but you are not aware of it and therefore, you keep on thinking that you are right. You are sensitive, vulnerable and tender at the same time, Adrianne Curry. When you love, you give your entire affection and your partner may in all confidence rely on a long-lasting and reassuring relationship. You are so calm and so tender that you think that it is enough to win over your partner's heart, and you are often right. However, do not mix up giving and receiving. You so deeply need to receive love in return that you may be too passive and in the long run, as you become demanding, you may show immaturity. Security and sustainability in your relationship are of utmost importance. Your family also is important, it is the refuge, even the sanctuary, where you like you hide when things go awry. You also dream of love, may be too much, and it may be detrimental to what might be concretely experienced if you were more dynamic or less fearful to get hurt. However, remember that you receive only as much as you give. Your iron will is part of your assets, Adrianne Curry. It is supported by an ingenuity and a skilfulness that may turn you into a mighty and feared personality. You have the knack of spotting weaknesses in persons you deal with and you can easily hurt them with your innate propensity to drill or to test their force. You are extremely stubborn and you never let go when you are convinced that you are right. Sexually, you are potent and passionate. You are domineering and secretive, with a magnetic personality. It is safer to avoid being taken in a conflict with you because you may be very aggressive and you bear grudges. In some cases, you may also be sadistic. Your personality is as secretive as it is domineering in the areas of action and sexuality. This text is only an excerpt from of Adrianne Curry's portrait. We hope that it will arouse your curiosity, and that it will prompt you to deepen your knowledge of astrology, as well as to visit and use the wide range of free applications at www.astrotheme.com.